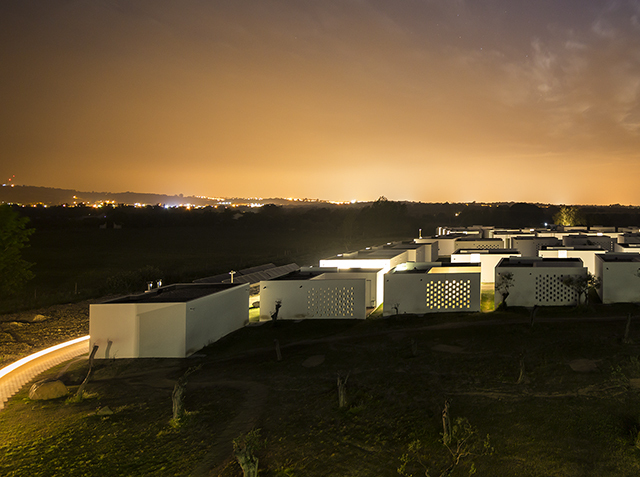 Scattered among a grove of cork and olive trees, the 56 private suites that make up Évora's new Ecorkhotel give travelers the opportunity to experience a contemporary and eco-minded lifestyle. 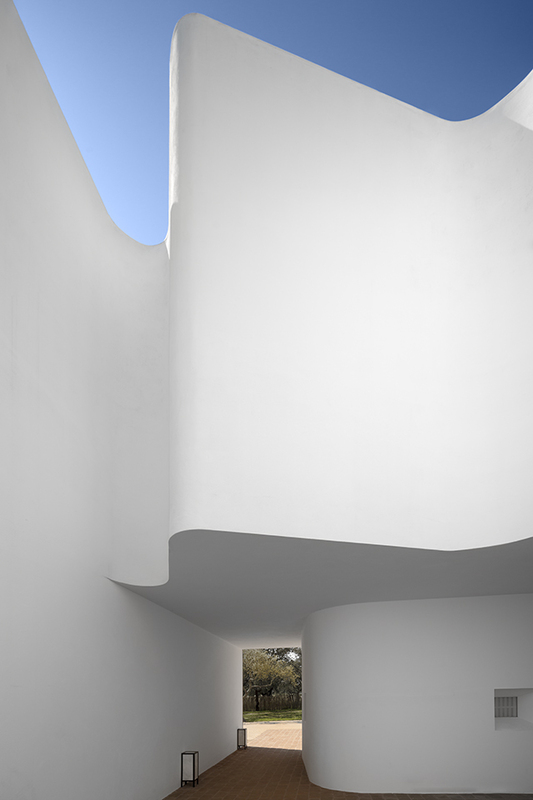 Designed by architect José Carlos Cruz, the architecture is a refreshing reminder of Portugal's traditional whitewashed plaster structures re-worked with a purist twist by balancing elements of simple form with nature. To relate the building to it's surroundings, Cruz outfitted the entire exterior of the main building with recycled cork cladding, a 100% natural product harvested by hand from the native cork oak - making the Ecork the first and only hotel in the world with this feature. The town of Évora is a UNESCOWorld Heritage Site, due to its rich history and well-preserved old town center. Évora is still mostly enclosed by ancient medieval walls, and houses a large number of monuments dating from various historical periods, including a Roman Temple. As the world has deemed this nearby land universally important, the realization of the Ecorkhotel was created with respect for the local history and consideration for nature. The hotel was designed with maximum energy efficiency in mind, using geothermal and solar energy to heat and cool 56 villa suites. In addition to the geothermal and solar technology, eco-minded materials such as cork wrap the exterior of the main building, working as a thermic and acoustic isolator. To mimic the twelve acres of rolling hills that the hotel is situated on, the architect designed large rolling curves that hang over the hallway that leads in and out of the main building. 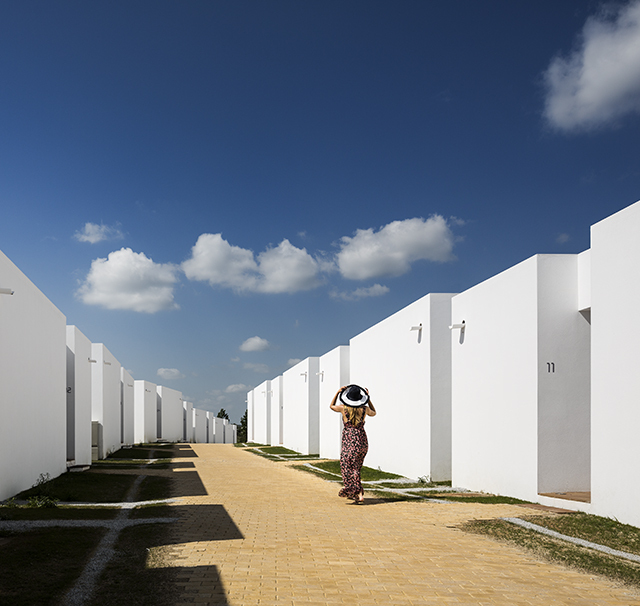 A gridded pathway of yellow bricks directs hotel guests through rows of connected boxy white villas, each with a small kitchen and private terrace, flat screen television, and eco-friendly linens. The walls of the hotel's courtyard and the villa terrace partitions have rows of cut-out shapes that cause interesting shadows throughout the day, and double as a glowing lantern in an ancient forest at night. The Ecorkspa has five treatment rooms, four being for private purposes and another room for couples treatments, the indoor swimming pool, a Turkish bath, and a sauna. The spa also features a relaxation room with a Chromotherapy device, where trained chromotherapists claim to be able to use light in the form of color to balance "energy" wherever a person's body be lacking, whether it be on physical, emotional, spiritual, or mental levels.